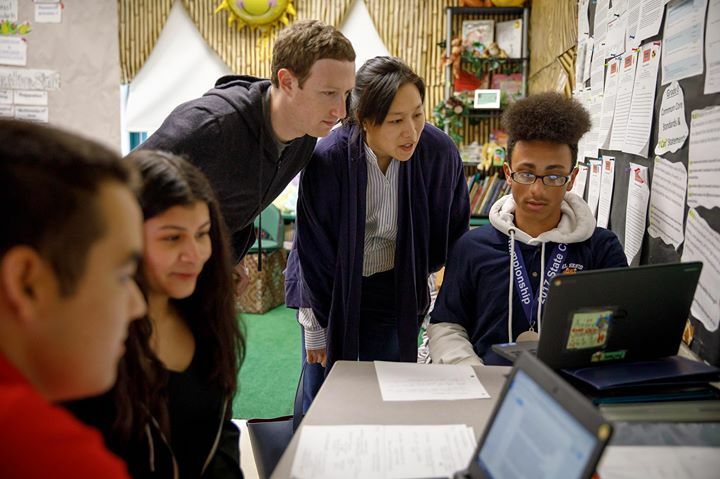 Mark Zuckerberg: Priscilla and I stopped by DelSesto Middle School in Providence, Rhode Island to see how they’re using personalized learning. Until a few years ago, DelSesto was one of the lowest performing schools in the state. Parents didn’t want to send their kids there, teachers were leaving, and the building literally had holes in the walls. Then in 2014, a first-time principal named Arzinia Gill came in to turn things around. DelSesto has rebuilt around personalized learning — helping students learn at their own pace in a way that works best for them. About one-third of the school is using the Summit Learning Platform we’re supporting at the Chan Zuckerberg Initiative. With personalized learning, teachers can quickly identify students who are struggling and add more lessons for students who get ahead so they can focus on what they’re interested in. One teacher told me, “I don’t treat my students like they’re 6th graders. My classroom runs on respect.” The cafeteria is almost empty during some lunch periods because most students spend the time getting extra learning or tutoring someone else. Rhode Island is a national leader with a plan to adopt personalized learning in all their schools. Priscilla and I left with some good ideas for how to improve the Summit Platform, and we’re excited to get personalized learning tools into the hands of more teachers and students.